Cyborg ninja! Yeah, Genji knows the deal. Not satisfied with being just an ordinary ninja, he became a half-robot, half-ninja hybrid! Alright, so maybe he and his brother got into a deadly fight that left him on the brink of death and becoming a cyborg ninja truly was his only option, but that’s beside the point! He’s definitely cooler as a cyborg ninja than just a normal ninja. It’s no wonder that your child wants to become the Overwatch character this year! 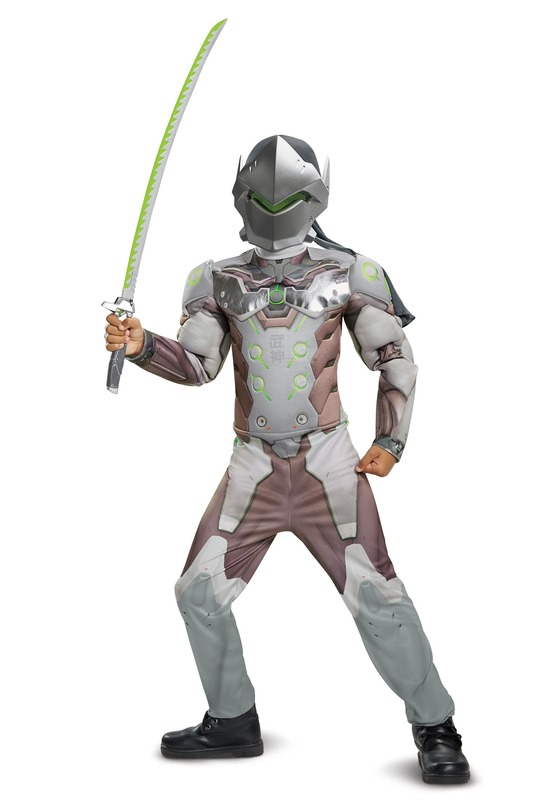 Based on the iconic video game character, this boys Genji costumes comes with many great details that will please any young Overwatch fan. It comes with a jumpsuit that has molded armor pieces attached to the top. It also has muscle padding in the chest and arms to give your child a buff and tough look. The bottoms also have printed armor The included hood fits over your child’s head and the molded mask fits with an elastic band to top it all off! Once your child has this costume on, he’ll be ready to cosplay as the coolest ninja-robot hybrid ever conceived. Just make sure you pair this costume up with a good toy katana. Genji never charges into battle without his trusty wakizashi! Also, be sure to check out our other Overwatch costumes to create a whole team of skilled fighters!